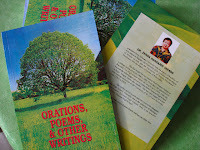 We received the first 10 copies of my mother's book, Orations, Poems, and Other Writings. The rest will roll off the presses tomorrow. Congratulations, Nanay!